The Community Planning & Design Initiative Africa – Win Prizes: cash, awards, internships. Winning designers will receive prizes and special recognition during the CPDI Africa Annual Awards Ceremony, hosted and attended by our Partner Organizations, Sponsors, the Press, special guests and supporting public! All designers will participate in feature ‘Art of African Architecture’ exhibitions and documentary films. Major feature in AMADi, our annual publication on contemporary residential design for building in Africa. Special feature in AMADi – the annual publication on contemporary residential design for building in Africa. Recognition and presentation of your submissions at the CPDI Africa Award Ceremony. Opportunity to earn paid internships with Southern Sahara and affiliate Organizations. 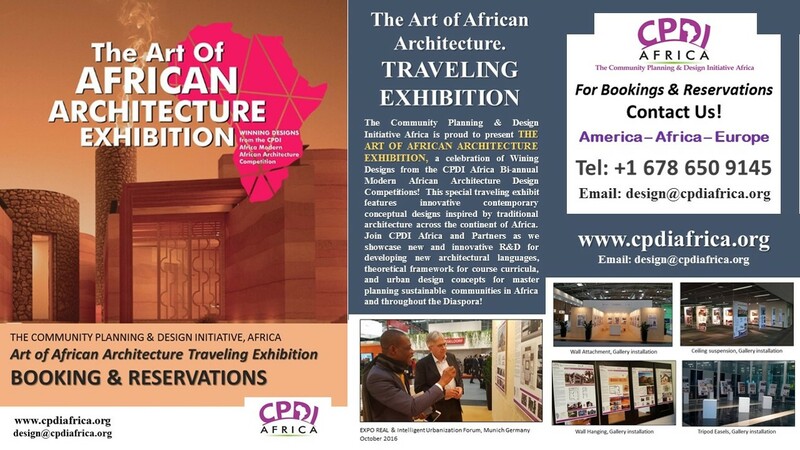 Opportunity to advertise your designs and architectural services on the International CPDI Africa platform. Invitation to participate in CPDI Africa design-build projects,in Africa & the Diaspora. planning and urban development for Africa.